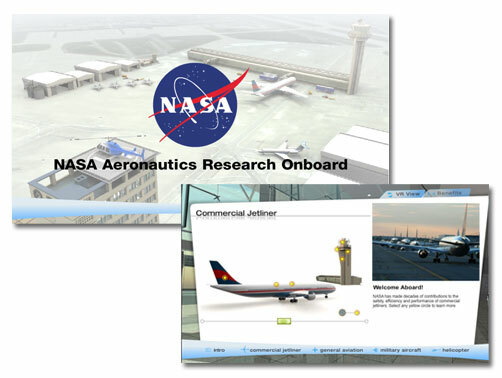 We created a 3D environment to display the contributions of NASA to aeronautics; commercially, militarily and structurally. Originally created as a touch screen for the Paris Air Show, then later adapted for the web. I did the concept, architecture design and programming. Matthew Skiens produced the 3D graphics and intro video, The project incorporated 3D rotation, sound and video.